Raven just can't get a break, can she? She got blown up AGAIN! If she was in both emotional and physical pain before, how will she live with herself after the Mount Weather explosion? Her path of recovery has hit a major roadblock. 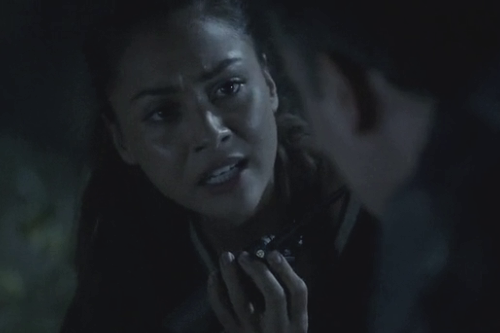 I sat down with Lindsey Morgan to discuss Raven's journey in The 100 Season 3. You can find the first part of the interview here: Lindsey Morgan Interview at BuddyTV. The decision to unlock the missiles at Mount Weather provided an escape for Raven in "Ye Who Enter Here. "Raven finally has a purpose and finally has a task, finally has something that she can put her mind on that isn't how much am I hurting today," Morgan said. Of course, that all changed. "When it's a total twist and Mount Weather blows instead of Polis, Raven is just in pieces, just absolutely in pieces and feels how could I have let this happen and how could I have failed so many people," Morgan said. "It's almost like she was at the rock bottom before and now she's in hell." Will Raven be able to move on from that? It's going to be a challenge for her. "There were talks of Raven of being suicidal ... that's where her mentality would be. What happens isn't that, obviously, but it's drastic enough. Raven does something so kinda un-Raven to alleviate her pain. She's trying to do anything she can," Morgan said. Is there any glimmer of hope that Raven can find happiness? Morgan teased, "There is. [Fans] will see that. It's a really interesting journey. I wish I could tell you more about how you're going to get both. You're gonna see Raven happy and you're gonna see Raven miserable and you're gonna see Raven in a whole new light." When asked to summarize Raven's journey through The 100 Season 3, Morgan summed it up as "Somebody you wouldn't expect to hit rock bottom, won't tell anyone. Then finds a way out that has dire consequences." The 100 airs Thursdays at 9 p.m. ET on the CW.